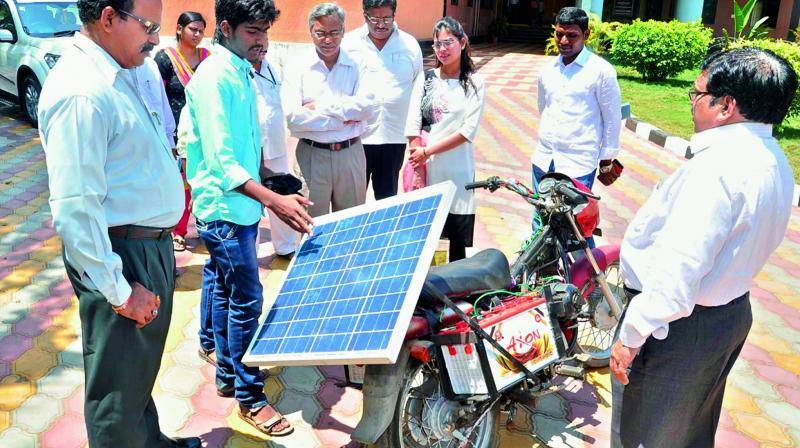 The students of Acharya Nagarjuna University, College of Engineering has invented a solar bike. This would run for six hours, if we charge with solar power for two hours. The good thing about this solar bike is that, it also has gears and can go upto 25 km speed. Students, G. Sumali, H. Lakshmi, Y. Manjula, M. Jayadev and B. Mohan, with technical cooperation of ANU mechanical workshop technician Rajesh, made the solar gear bike.